A sophisticated, more versatile version of the standard Hutchins HUSTLER, with special refinements. Powerful twin-drive for perfect alignment, with 2-Cylinder reciprocal thrust impelled by vertically-engaged gears guarantees smooth synchronized strokes of superior surface preparation. Eliminates operator fatigue, while providing full contact sanding without battering the surface. 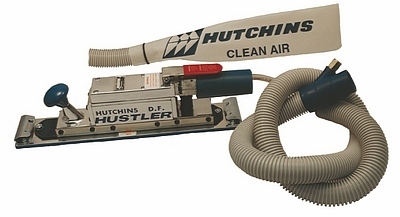 Multi-Options include full COAXIAL Hose for choice of vacuum sanding, or dust-free sanding using a detachable Dust Bag for shops without vac-systems. Comes complete with Dust Bag. Tools do not come with optional pierce plate. Optional 2 3/4" X 16 1/2"